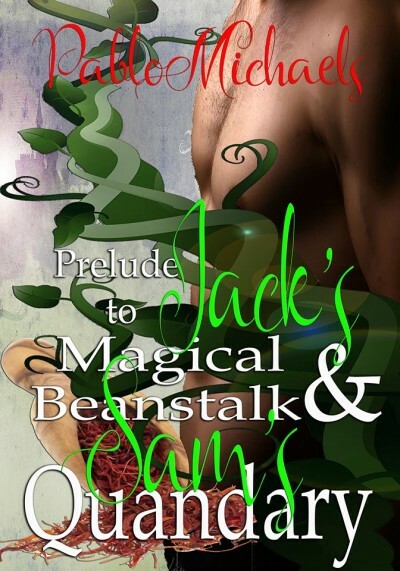 Jack’s Magical Beanstalk & Sam’s Quandary is the story of Jack and the Magical Beanstalk seen through Jack’s partner and lover’s eyes. The story began when Jack’s future love interest, Sam watched him flee from the evil giant Master with his bag of gold coins. When they met they were infatuated with each other. Through Jack’s escapades with Master, Sam eventually followed Jack down the magical beanstalk to live with Jack but the beanstalk had to be cut down. Subsequently, Sam was prevented from seeing his father and brothers. When Sam discovered his father’s illness, he conspired to plant a new magical beanstalk, having to do so secretly. Adam the farmhand had his suspicions and blackmailed Sam into a sexual fling to keep the secret. Did Sam save his father from sickness?